We ended up with 17 beers at the tasting phase plus the main event drafts of an additional 8 beers. We were going so strong that we added an additional hour and carried the party to 11:00. The final tally is in and we raised $2,320.78. Thank you one and all for making this event such a great success. I would like expend a special appreciation to the following organizations for their participation in this event. Jamie Robinson, Boxcar Brewing Co.
Plus we have added three award winning Black Box Wines and Old Dominion Root Beer on draft for the non beer drinkers. Here is the updated Flyer. Here I go beer-ing it up again! On May 7, 2011 Just before American Craft Beer week I am organizing another Beer Event. This time it’s American Craft beer. Don’t worry; I will still be having a Belgian Event in the fall. 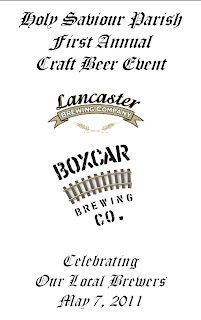 I have wanted to do an American Craft Beer Event for some time now but could never seem to work out the logistics of having two events in one year. Holy Saviour Parish is 95 years old and in serious need to renovate their aging facilities. The problem is that any renovations have to be brought up to the current building code and standards including handicap accessibility. This is a tremendous expense for such a small parish. So I got together with our Pastor, the Knights of Columbus and the Women’s Club and here is OUR solution! What better way to raise money for a good cause than to raise a glass! This event is similar to our other events but with a local twist! Instead of having a tasting table supplied by the guests, I invited local brewers to come in for a 2 hour tasting. 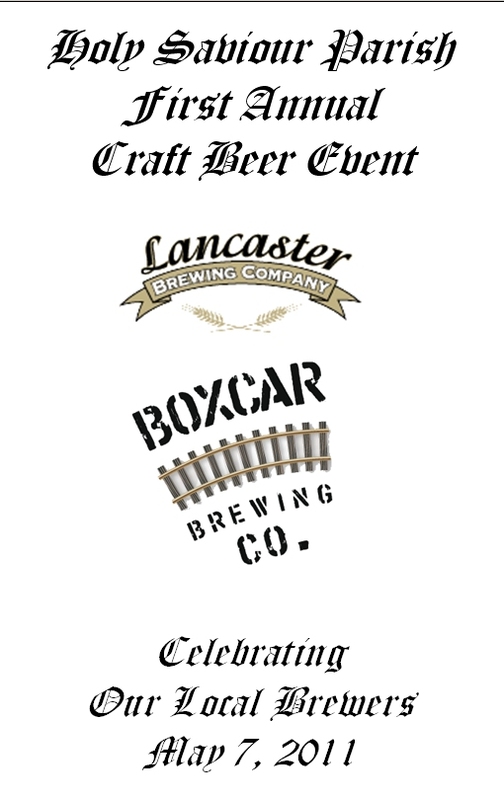 Our special featured guest is Jamie Robinson of Boxcar Brewing Co. in West Chester! Plus we have 6 local Craft Beers on draft, full buffet dinner from the home-style cooking of the Holy Saviour Women’s Club and DJ Extraordinaire, Peiser! Please share this link with we anyone that may be interested. If you pay through the website or by mail to me your ticket will be mailed to you the next day at no cost to you. It’s going to be a great event for a truly worthy cause. Thank you so much for helping out! We couldn’t do it without you!